While Thanksgiving is still technically in the fall season, it’s always seemed like more of a winter holiday to me. For whatever reason. Halloween, on the other hand, always, always, always, embodied autumn. Everything about Halloween makes me think about the fall season and how awesome it is: crisp air, fallen leaves, the smell of smoke that lingers in the air, and, of course, desserts and candies galore (all gluten-free, of course). Other things that come along with the Halloween holiday are parties. While the kids go trick-or-treating, invite some friends over for some games, drinks, and desserts. You can turn a night of candy-giving into a wonderful evening with friends with awesome gluten free Halloween recipes from FaveGlutenFreeRecipes.com. Make your own candy and pile brownies high—these recipes are everything you’ll need for a successful Halloween party (including adult-only beverages). 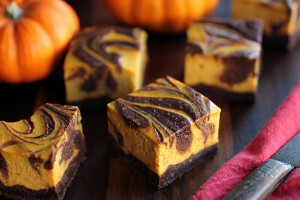 These Bourbon Pumpkin Cheesecake Brownies will be eaten so fast you won’t believe it. 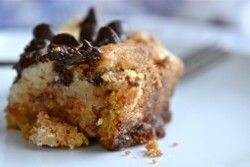 This indulgent gluten free dessert takes the best of cheesecake and brownies and combines them with a decorative swirl. Not only does this pumpkin cheesecake dessert look elegant, it tastes wonderful. These Heath Bar Crunch Cupcakes are inspired by Ben and Jerry’s Heath Bar Crunch ice cream flavor. 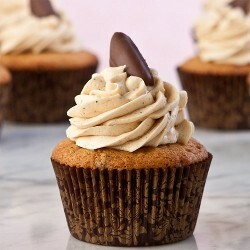 These gluten free cupcakes are topped with a coffee toffee buttercream and pieces of Heath Bars. 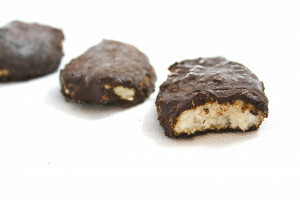 You can make candy right in the comfort of your own home with this Homemade Mounds Bars recipe. These tasty candies are much better for you than the store bought version and are incredibly easy to make. This scrumptious cake recipe is a great alternative to Halloween candy, but the flavors found here can be enjoyed at any point in the year. Use a gluten free cake mix to its full potential with this Pumpkin Crack Cake recipe. 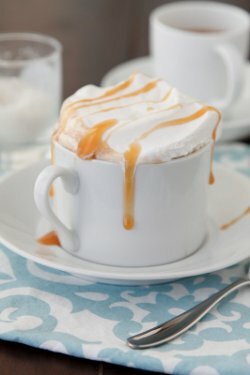 Boozy Salted Caramel Mocha adds a fun spin to the traditional Starbucks-inspired treat. If you’re planning a chilly weather cocktail party, this is a great idea your guests will love. Add a little splash of fun to your next gathering with this wild and wonderful recipe. Check out more awesome gluten free Halloween treats here!